Fenster never hears from her son ("He should call the woman who mopped floors to put him through medical school?"). She lives alone and spends her days waiting in line at the post office ("They couldn’t have a chair?"). When it is suggested to her that she may suffer from depression, she joins a group at the senior center. And therein begins her journey. Join Fenster for an evening of stories, observations and acerbic wit. Open your heart to a touching story of growing old and finding happiness in the most unexpected of places. Gennady Goushin, Renaissance Portrait from the series Alternative Museum (detail), 1989-90. Photo collage. Norton & Nancy Dodge Collection of Nonconformist Art from the Soviet Union. This graduate student colloquium explores the themes American Pictures and Portraits, the Anonymous and Identified, Scale, and The Single and the Collective in portraiture. Sylvia Yount, Chief Curator and Louise B. and J. Harwood Cochrane Curator of American Art at the Virginia Museum of Fine Arts, is the keynote speaker. Attendance is free and lunch is provided. Space is limited, however; first come, first served. RSVP to rsvp@zimmerli.rutgers.edu. For details, visit their website. This graduate student colloquium, organized by the Zimmerli Art Museum and the Department of Art History, Rutgers University, is generously funded by the Andrew W. Mellon Foundation. John Taylor Arms, In Memoriam, Chartres Cathedral, 1939. Etching. Gift of the Estate of Raymond V. Carpenter. Celebrate Aspects of Architecture: The Prints of John Taylor Arms with a curator-led tour of the exhibition followed by a reception in the lobby. Medieval and early Renaissance choral music complements the inspiring prints of Gothic architecture. Artist Patricia Brace leads an ongoing hands-on workshop exploring how Arms employed linear perspective and offers instruction in drawing buildings, applying the principles of two-point perspective. For program times and other details, visit their webpage. The Zimmerli's operations, exhibitions, and programs are funded in part by Rutgers, The State University of New Jersey; the Estate of Victoria J. Mastrobuono; the New Jersey State Council on the Arts/Department of State, a Partner Agency of the National Endowment for the Arts; Johnson & Johnson; and the donors, members, and friends of the Zimmerli Art Museum. BENEFIT FOR AREA 3 SPECIAL OLYMPICS & HANOVER WIND SYMPHONY—A FAMILY EVENT! For further information and tickets to the Rock 'N' Winds '70s Night, go to http://youchoose.ticketleap.com/rock-n-winds-70s-night/, or contact You Choose organizer Dave Philp at 917.204.1929 or Dave@MyYouChoose.com. Ever dream of singing your favorite '70s song, backed up by a band or an orchestra? Have you been longing to dedicate a song from the '70s, played live, to your best gal or guy? How about accompanying or dancing to your fave song from the '70s, played by a band or an orchestra—or both? Now, by making a donation to a worthy cause, you can realize your dream. Who can forget the music of the '70s? You remember—Led Zeppelin, Dire Straits, ELO, solo McCartney or Lennon, Crosby, Still & Nash, the Bee Gees, Fleetwood Mac, Donna Summer, Elton John, and even Disco. The Hanover Wind Symphony and the You Choose Band will team up to present a fun-filled "Rock 'N' Winds '70s Night" family concert. And you can choose to have your favorite tune played by either the 70-piece Hanover Wind Symphony or the 10-piece You Choose Band, or both. The event will benefit Area 3 Special Olympics, serving Morris, Sussex and Warren counties, as well as the Hanover Wind Symphony. Both are non-profit organizations that serve the local community. For full details on how you can be part of this event, visit http://youchoose.ticketleap.com/rock-n-winds-70s-night/. Hurry! The deadline to sign up with your request is Monday, May 7. And don't forget to specify if you'd like to sing with the HWS, the You Choose Band or both, or even conduct the orchestra. Just e-mail Dave@MyYouChoose.com and specify the song you want to hear. To view the song list so far, visit http://myyouchoose.com/258/rock-n-winds-70s-night-songs. A family-friendly event, the Rock 'N' Winds '70s Night will include a special area for children to play that's visible so parents can watch their kids and still enjoy the music. Before the concert, there will be a tailgate party outside the venue (weather permitting). For a special "Be a Macho Man for the Special Olympics" promotion that night, you can dress up as one of your favorite members of the Village People band (the Cowboy, the Cop, the Native American, the Construction Worker, the Biker, or the Sailor), and strut your stuff while the You Choose Band plays "Macho Man." Go to http://myyouchoose.com/434/be-macho-man-special-olympics for details. The mission of Special Olympics is to provide year-round sports training and athletic competition in a variety of Olympic-type sports for all children and adults with intellectual disabilities, giving them continuing opportunities to develop physical fitness, demonstrate courage, experience joy and participate in sharing of gifts, skills and friendship with their families, other Special Olympics athletes and the community. For more than 25 years, the Hanover Wind Symphony has played to enthusiastic audiences in and around greater Morris County. The symphony thrives on sharing the enjoyment of music with live audiences, and helps mentor the next generation of wind musicians. Robert Kern’s interest in photography began at age eleven and continues to this day. He graduated from the School of Visual Arts in NYC and has studied with many established photographers and artists. Specializing in interior and architectural photography, Kerns’ work has been published in many magazines, books and publications. He teaches photography and art privately in adult education classes and on-line chats. He also enjoys sharing his knowledge and love of digital techniques, lighting and printing. He is one of nine artists who co-founded GlowArtworks.com to promote healing through art. *Gallery hours are Monday – Thursday, 9 AM – 10 PM; Friday and Sunday, 9 AM – 5 PM; closed Saturday and Jewish holidays. Admission is free and open to the community. For more information contact Rochelle Lazarus at 201.408.1408 or visit the JCC website at www.jccotp.org. This show is an ongoing; study of mans’ creations in nature. Most of the imagery comes from the NY and NJ area. ADMISSION: FREE but reservations are requested for groups over 20. Talented young performers from the Mayo PAC Performing Arts School will be bringing their delightful show “The Best of Broadway!” to the Giggles Children’s Theater. For further information about performances, to make a donation or to receive monthly show schedules, contact Giggles Director Marie Caliendo at 973.754.4623 or mcaliendo@mmissions.org. The mission of the Giggles Children’s Theater is to uplift the spirits of underserved pediatric patients with uplifting live performances. Shows are simultaneously broadcast throughout the hospital so that children who are too ill to leave their beds can still enjoy the performance and interact with the artists over the telephone and TV. Giggles is a project of Medical Missions for Children, a NJ based nonprofit organization dedicated to improving the medical outcomes of underserved pediatric patients in Paterson, the US and in 109 countries throughout the world. For further information, see their website: www.mmissions.org. Don't miss this acclaimed 2009 Broadway revival of one of the masterworks of American musical theater! From the first note to the final breath, West Side Story is one of the greatest love stories of all time. Directed by David Saint, using Tony-winning librettist Arthur Laurents’ Broadway direction, West Side Story remains as powerful and poignant as ever. The score by Leonard Bernstein and Stephen Sondheim — which includes standards “Tonight,” “America,” “Maria” and “Somewhere” — is regarded as one of the best ever written for the stage, and the extraordinary choreography by Jerome Robbins did nothing less than rewrite the language of Broadway dance. TICKETS: available online, via phone at 1-888-466-5722, or at the NJPAC Box Office, One Center Street, Newark. The NJPAC Call Center answers calls Mon.-Sat. from 10 AM to 6 PM, and Sun. from noon to 5 PM. The NJPAC Box Office is open Tue. to Sat. from noon to 6pm, and Sun. from noon to 5pm. Please note that tickets purchased online and via phone are subject to a per-ticket handling charge. WHEN: now thru May 27; Thursdays, Fridays at 8 PM; Saturdays 3 PM & 8 PM; Sundays 2 PM. TICKETS: $40; $36 (Seniors 65+); $25 (Students 13 - 25); Discounts to groups of 10+. Tom’s concerts and recordings are sparked by strong, intelligent songwriting with clear, engaging vocals and the intricate, melodic guitar work that has become his trademark. He has recorded ten albums of adult-oriented material. WIN TWO CHAPIN TICKETS AND A $50 HOULIHAN'S GIFT CERTIFICATE! Let's just cut to the chase this time, no contest, no requirement at all but that you send an -email to theatre@rvccArts.org with the subject "pick me!" (don't forget the exclamation point or we'll think you insincere) to be entered into a random drawing. Winner will be drawn at 4 PM, Thursday, May 3, and notified by e-mail shortly thereafter. WHERE: JCC of West Orange, 760 Northfield Ave., in West Orange. TICKETS: $15 apiece for adults and $10 apiece for students and senior citizens. Tickets may be purchased through the symphony's website, www.hanoverwinds.org. "This concert is a great celebration of the art the Hanover Wind Symphony brings to our community, and the support our community brings to the Hanover Wind Symphony," says Matthew Paterno, conductor of the Hanover Wind Symphony. Music for a Carousel was inspired by childhood memories of the old mechanical barrel organs that used to be an integral part of the experience of riding carousels in places like Palisades Amusement Park, Coney Island, and the National Mall in Washington, DC. In this work, the composer has imagined that each group of instruments in the orchestra represents a carousel animal, gliding up and down and whirling around in relative motion to the other animals on the carousel, while children laugh and sing and reach out for gold rings. The music reflects this in the undulating shape of the melodic lines and in the manner in which the counterpoint among these lines is shaped. There is also an attempt to evoke the actual sounds of the barrel organ with some slightly usual scoring, in particular, the trio obbligato of E-flat clarinet, piccolo, and bells over the muted cornet's statement of the main melody. The woodwinds invoke the squeal of the reed organ, while the bells provide the "gold rings" for which the children reach at every turn. The piece will bring back happy childhood memories of riding an antique carousel on a sunny Sunday afternoon at a favorite amusement park. As a composer, Centenaro has three comic operas to his credit as well numerous other vocal works, concerti, chamber pieces, and three major works for concert band. His musical style could best be described as "eclectic retro" in that he makes no attempt to write "modern music," but rather enjoys writing in the styles of his favorite eras of the musical past, producing comic evocations and parodistic re-creations of the music of Mozart, Rossini, Verdi, Sullivan, Offenbach, Sousa and the Ragtime and Tin Pan Alley composers of the early 20th century. Stanley Chernavsky of Livingston will be the piano soloist at the concert, performing Grieg's Piano Concerto in A Minor. He has been cited as a "Hometown Hero." Chernavsky, 16 years old and a sophomore at Livingston High School, began studying the piano at age 6. In his brief career, he has won awards in several competitions, including the Piano Teachers Society of America Spring Festival, the International Young Musicians Competition, and the American Protégé 2010 International Competition of Romantic Music. As the winner of the 2011 Young Artists' Concerto Competition, Chernavsky made his orchestral debut with the Livingston Symphony Orchestra. In 2008, he was accepted to the prestigious Juilliard School Pre-College Division. He has performed in Weill Recital Hall at Carnegie Hall, Merkin Concert Hall, and at the Juilliard School. For more than 25 years, the Hanover Wind Symphony has played to enthusiastic audiences in and around greater Morris County. The symphony thrives on sharing the enjoyment of music with live audiences, and helps mentor the next generation of wind musicians. The Hanover Wind Symphony serves the community by playing marches, toe-tappers, and standards while also presenting pieces written by current active composers, some of whom are members of the ensemble. The group provides a platform to showcase world-class artists, among them Joseph Alessi and Philip Smith of the New York Philharmonic; Patrick Sheridan, one of the world’s most famous tuba players; Steven Meade, world-renowned euphonium soloist and recording artist; and Dr. Paul Cohen, the world’s premier classical alto saxophone player. The Hanover Wind Symphony received a 2011 Local Arts Grant from the Arts Council of the Morris Area. Log onto our Website for Reservations and show details. Pick Your Seat with our new Ticket System!! For information or tickets call 973.928.7668. TICKETS: $18 general admission / $16 seniors and students. 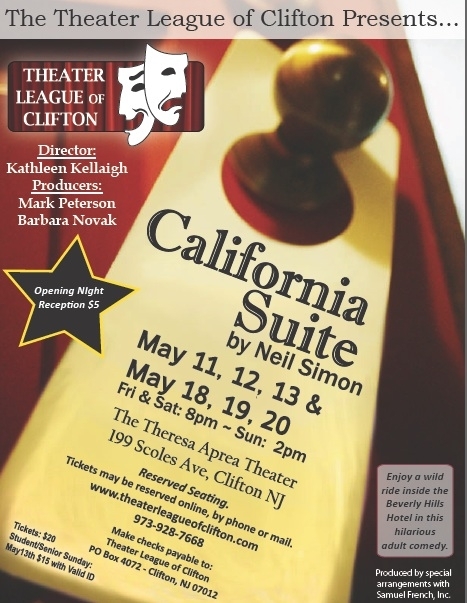 Call 908.879.7304 for tickets and information or reserve seats online at www.ctgreservations.com. Set in the mountains of Connemara, County Galway, this darkly comic Irish tale of Maureen Folan, a plain and lonely woman in her early forties, and Mag, her manipulative, aging mother, who interferes in Maureen's first and possibly final chance for a loving relationship, trigger events that lead relentlessly towards the play's terrifying resolution. This play won four Tony awards and the 1998 Lucille Lortel Award for Outstanding Play. Wine and cheese will be served opening night after the performance. TICKETS: $20, and $18 for senior citizens. Group rates are in effect for groups of 15 or more. Reservations may be made by calling 973.316.3033. Southern Comforts was produced off Broadway and was a finalist for the Susan Smith Blackburn writing award. The play stars Actors Equity performers, Robert M. Hefley and Nona Pipes, a husband and wife couple from New York City. This program is made possible, in part, by funds from the New Jersey State Council on the Arts/Department of State, a Partner Agency of the National Endowment for the Arts, and administered by the Somerset County Cultural and Heritage Commission through the State/County Partnership Local Arts Program. Explore the Rutgers University Geology Museum. The museum is free and open to the public & offers exhibits, scavenger hunts and tours and programs. The museum Self-service scavenger hunts for different ages are always available. Tours can be scheduled. Click here for more information on special events at the museum. Late Nights at the Museum on the first Wednesday of each month feature activity stations for children and adults from 4-8 PM. On the third Saturday of every month the Geology Museum provides free tours to prearranged groups of 10 to 50 people. Guests of all ages learn about dinosaurs, geology, the Ice Age, mastodons, mummies, and minerals with special attention given to New Jersey-based exhibits. Tours must be booked at least two weeks in advance. Enjoy a live, interactive demonstration of the exhibition Musical Machines & Living Dolls. Visit our permanent exhibition, Digging Dinosaurs, and learn all about the lives of dinosaurs, featuring Hadrosaurus foulkii, the NJ State Dinosaur! At 12:30 and 2:30 Sing with the Dinosaur Troubador and 15-foot long Mighty T.rex (courtesy Field Station: Dinosaurs). Drop in activities all day include: make your own dinosaur puppet, climb into a dinosaur nest and learn about baby dinosaurs, reconstruct a dinosaur skeleton, touch a real Hadrosaurus egg, and much more. Celebrate Chinese arts, crafts and culture, with exciting performances and intriguing hands-on activities, including making a clay pot, decorating a dragon, making paper dragons and paper lanterns. A master Chinese calligrapher will demonstrate his craft from 12:30-2:00 PM, and Celadon Youth Music Ensemble will perform at 3:00 PM. Young sculptors will bring home a project with each workshop. Instructor Don Thieberger has been teaching children the art of pottery sculpting for over 20 years. For more information on Studio Art workshops click here. The day offers an array of fun and fascinating programs for the entire family including story tellers, animal shows, art projects, a petting zoo, music and dance performance, hands-on activities and amazing science demonstrations. Admission and parking are free. Activities, demonstrations, and performances await visitors on every campus. The College Avenue Campus features storybook readings, puppet shows, scavenger hunts and craft projects. The Busch Campus spotlights science, offering demos and events for science enthusiasts. And Cook/Douglass is where you'll find the NJ Folk Festival, a petting zoo and more. Photo courtesy of Rutgers University. In wartime 1941, German atomic physicist Werner Heisenberg traveled to Nazi-occupied Copenhagen to see his old friend and mentor, renowned Danish physicist Niels Bohr. Side by side, almost as father and son, Bohr and Heisenberg revolutionized nuclear science in the 1920s, but they had since been pulled apart as they found themselves on opposite sides of a World War. Why did Heisenberg meet with Bohr in the middle of the war? COPENHAGEN allows Heisenberg and Bohr, along with Bohr’s wife Margrethe, to reunite beyond time and explore what happened or didn’t happen at that meeting, as they wrestle with the powerful yet often uncertain bonds of country, conscience, love and loss in a world whose very core is on the verge of being split apart. The collection on view represents a revival of the craft of film poster art. Before 1987, it was the norm for noted artists like Saul Bass, Reynold Brown, Bob Peak and Richard Amsel to create arresting images to market a film with lithographic posters; this contrasts greatly with today's familiar lightbox posters, often using a star's face, rather than art, to sell a film. Of the approximately 20 works presented, the artists represented include Martin Ansin, Kevin Tong, Tyler Stout, Billy Perkins, Jeff Kleinsmith, Todd Slater, Jesse Phillips, Joshua Budick and Ken Taylor. In this film, Jean Marc Calvet recounts his incredible life story as a street kid turned painter. ADMISSION: Admission for the Guitar Workshop is $25 in advance; $30 at the door. House Concert admission is $15 in advance; $20 at the door. Tickets may be purchased at the door or in advance at The Minstrel, held each Friday night at the Morristown Unitarian Fellowship, or online at www.folkproject.org. For further information, go to www.folkproject.org. or call 732.841.1348. Keith Murphy, founding member of the group Nightingale, guitarist, teacher and clinician, will present a Day of Music, starting with a guitar workshop at 4:00 PM. After a pot luck dinner at 5:30 PM, Keith will perform a house concert at 7:00 PM. After the concert, attendees will be invited to share their own music at an Evening of Music starting at 9:00 PM. The event is sponsored by The Folk Project, a non-profit organization promoting acoustic music in northern New Jersey. Preschool through high school artists will display their artwork in the second annual MG Kids Art Show and compete for $50 prizes and the chance to have their creations permanently displayed at Morristown's Spring Street Community Development Corporation. The show is part of St. Peter's two-week community arts festival, which also includes a poetry night May 1 and a full day of arts workshops for children ages 6-13 on May 12. Artwork will remain on display through May 13. At the grand opening on April 27, the Family Success Center of Morris County will provide hands-on arts activities for children from 3 to 6 PM. At 7 PM, the Peter Moffitt Medicine Show, featuring New York area jazz musicians, will perform in a jazz coffeehouse. Coffee and desserts will be provided by Smartworld Coffee and Chef Melody of The Main Event. Art show exhibitors also are invited to be on hand to discuss their work from noon-5 PM on May 6 as part of the Morristown Art Walk. In conjunction with the art show, the Family Success Center is sponsoring a contest, with winning entries being displayed at the center's office at the CDC launched by Bethel AME Church. Artwork will be displayed throughout St. Peter's Spring Arts Festival, where voting will take place, and later at the Family Success Center. Registrations are being accepted for the May 12 Children's Day of Art, which will feature workshops in cartooning, drama, eco-sculpture, music, poetry and pottery from 9 AM to 4 PM, followed by a reception for the artists, instructors and parents. You can find a registration form at http://morristowngreen.com/2012/02/22/community-arts-show-jazz-and-poetry-coming-to-morristown-this-spring/artsfest-reg-form_fillable/. Cost is $20, with scholarships available. Fans of the classic Hitchcock whodunit The 39 Steps may not realize that the stage version, opening next month at George Street Playhouse, is, unlike the movie, very, very funny. To complement the onstage antics, the New Brunswick theatre is offering a slate of off-stage events sure to up the ante on the fun scale. The first event will be “A Look Through the Rear Window”—a behind-the-scenes chat with director Mark Shanahan, who will talk about the references to Hitchcock contained in the play, using clips from classic Hitchcock films. The chat will take place Saturday, May 5, beginning at 6 PM in the Playhouse’s cabaret space, and includes appetizers from Tumulty’s Pub and a cash bar. The cost for this event is $15 and includes the discussion and appetizers. Reservations are required and may be made through the GSP website (www.GSPonline.org ) or Box Office, 732.246.7717. George Street Playhouse subscribers may purchase tickets for the event for $12; subscribers must purchase their tickets directly through the Box Office. Audience members are encouraged to dress up as their favorite Hitchcock character on Saturday, May 12. Starting at 7 PM, George Street Playhouse staffers will wind their way through the audiences and award prizes for the best and most original costumes. Potential participants are encouraged to pre-register for the event on the Playhouse website (www.GSPonline.org), or by calling the GSP Box Office, 732.246.7717. Finally on Thursday, May 17 George Street Playhouse in partnership with Clydz restaurant will offer a post-show “Marnie-tini” party. For the price of $55, patrons will receive a ticket to the 8 PM show, plus admission to the post-show revelry, featuring specially-priced drink specials (the “Vertigo” and the “Hitchcocktail”) as well as complimentary bar snacks. Tickets can be purchased through the George Street Playhouse Box Office 732-246-7717, or via the Playhouse website—www.GSPonline.org—using the code MARNIE. Patrons already holding tickets to the May 17 performance may add on the party by contacting 732.846.2895 ext 134. George Street Playhouse is located at 9 Livingston Avenue in the heart of New Brunswick’s Dining and Entertainment district. About the Play: Just what ARE The 39 Steps? When the beautiful and mysterious Annabella Schmidt turns up dead in his apartment, Richard Hannay (played by Howard McGillin) goes on the lam to prove his innocence. In the process he must find the man with the missing finger, romance the beautiful blonde—and solve a mystery of magnificent proportions. Based on the well-known Hitchcock film, The 39 Steps is sure to delight theatergoers who don’t know Rear Window from Vertigo, as well as those who know every frame of every film. The cast includes Broadway and Regional theatre veterans Michael Thomas Holmes, Stacie Morgain Lewis, Mark Price and two-time Tony Award nominee Howard McGillin. Under the leadership of Artistic Director David Saint, George Street Playhouse has become a nationally recognized theatre, presenting an acclaimed mainstage season while providing an artistic home for established and emerging theatre artists. Noted Arts Administrator Norma Kaplan was appointed Managing Director in September 2011. Founded in 1974, the Playhouse has been well represented by numerous productions both on and off-Broadway—recent productions include the Outer Critics’ Circle Best Musical Award-winner The Toxic Avenger, the Outer Critics Circle, Drama Desk and Drama League nominated production of The Spitfire Grill and the recent Broadway hit and Tony® and Pulitzer Prize winning play Proof by David Auburn, which was developed at GSP during the 1999 Next Stage Series of new plays. In addition to its mainstage season, GSP’s Touring Theatre features four issue-oriented productions that are seen by more than 40,000 students annually. George Street Playhouse programming is made possible in part by funds from the New Jersey State Council on the Arts/Department of State, a partner agency of the National Endowment for the Arts, and by its lead season sponsor, Johnson & Johnson. The Star-Ledger is 2011-2012 Official Print Media Sponsor of George Street Playhouse. KIDS’/FAMILY ACTIVITIES @ THE NEWARK MUSEUM!